APPLE "BEST OF 2018" AWARD-WINNER -- A clear, simple approach to meditation with a NY Times bestselling author and some of the most respected (and cool) meditation teachers on the planet. Designed for skeptics, built to help you keep it going. - Daily videos and guided meditations to teach you meditation in the simplest way possible. - A range of content for coping with anxiety and political stress, and for activities like walking and falling asleep. - New content weekly to keep meditation from becoming a chore. - Apple Health App integration for tracking your progress. ** Featured on The Daily Show, Good Morning America, Nigthline, The Rachael Ray Show, and more. In his top-ranking podcast, Dan talks with smart people about whether there's anything beyond 10%. Basically, here's what the podcast is obsessed with: Can you be an ambitious person and still strive for enlightenment (whatever that means)? If you’re enjoying the app, please (re)post a review. It really helps! Questions/technical support? Please email us at support@10percenthappier.com. We've redesigned the Profile tab, added stats after you've finished a meditation, cleaned up some bugs, and added more fresh meditations. Enjoy! • Profile: We've redesigned the Profile tab to include your total mindful days, minutes, progress over the last month, and your meditation history. • Post-Meditation: Now, after a meditation you'll see your progress and an easy-to-share update on your mindful stats. 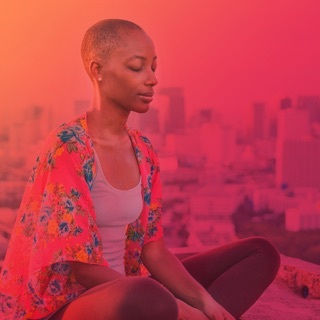 • Weekly New Meditations: We've added a few sleep meditations with Jeff Warren and Oren Jay Sofer, a stress meditation with Diana Winston, a meditation on patience with Sebene Selassie, a morning meditation with Jessica Morey, and more! As always, hit us up with any feedback/comments/questions on Twitter, Facebook, Instagram or at support@10percenthappier.com. While you're here... we've included snippet from a recent edition of our "Meditation Weekly" newsletter. Chilling out is not enough. But that's the tip of the iceberg. The real point is happiness. Here’s the thing. De-stressing is actually a pretty simple process. When you’re stressed out, the neurons are firing, the heart is pumping, the hormones (cortisol, adrenaline, and others) are flowing. If you can just decrease the rates of all those things, you’ll return to a more balanced state. You’ll chill out. Meditation is one of many tools that can do that. You can also just take a few deep breaths, go for a walk, or Netflix & Chill. Anything that interrupts the feedback loops of mind and body will do the trick. But if that’s all you’re doing with meditation, you’re kind of missing out. Because the real benefit of meditation comes not from the chilling out but from the seeing clearly, which comes next. That’s what actually leads to happiness. What’s really going on in mindfulness meditation are actually two processes: calm and insight. Calm is what we just talked about; it’s the slowing down of the mind by focusing on a single object (breath, a phrase, whatever) for awhile. Relaxation is basically a side-effect of that. The point of focusing the mind, though, isn’t just to chill out: it’s to see clearly. What do you see? Well that depends on where you look. In many spiritual contexts, you might notice how things that seem fixed in place are actually very impermanent: feelings come and go very quickly, for example, which is helpful if you’d like to let go of that consuming anger/ anxiety/ whatever that has been causing you so much pain. In other spiritual contexts, you might notice how beautiful things are if you can just “be here now.” A simple blade of grass can seem filled with miracles. Or, in secular contexts, you might see your “stuff” more clearly: how much you love someone, how you sometimes get in your own way, how your habits are helping or not helping you live your best life. I find this program to be rich with workable options and opportunities to learn about (and manage, bit by bit) my mind and entrenched mental habits. It has helped me in several ways, maybe because it gets straight to a point without any pseudo-spiritual “fluff”. It is not about stopping thought. Rather, I see it as helping users to notice and learn about one’s habitual thoughts, emotions and responses. For example I notice feeling less scattered, and less reactive since starting 10%H a year+ ago. It is a subtle vs dramatic shift. The speaker/guides are racially and culturally diverse and have very different styles and approaches to choose from. 10% H coach Joshua has enhanced my ability to navigate the sessions with timely, personal, practical suggestions. The app keeps developing as a work in progress which I like. 10% Happier is a realistic name for this app. I hope it is increasingly available to folks who have different kinds of devices other than iPhones. I recommend it highly. Thank you Dan Harris, Joseph Goldstein, Joshua and all of you who design and teach this practical approach to meditation. You have made a very positive difference not only for me but also for others to whom I have gifted your program. Find the time to listen to yourself. It’s worth it. After 1 week, I am sold. Simply taking a few minutes out of my day to reflect and focus my thoughts has made for an interesting experience. When I first started, I couldn’t see past the restlessness I felt inside; I found myself focusing too deeply on the back and forth rocking sensation I felt as my heart beat, and was surprised by how much motion was still occurring beyond my control as I intentionally attempted to be still and clear my mind. Today, I am finding myself more aware of many other sensations going on inside me — the rocking motion, I can still feel but only as I focus my awareness on my heart beating instead of my nostrils flaring or my wandering thoughts. I’ve been so impressed with meditation, I’ve convinced my wife to give it a try as well, and now we both plan time before bed to be guided through the basics of meditation. Now she’s hooked as well! I know this is only the beginning, but I’m very excited to see where this leads. If I can feel this way after only a week, I can only assume the benefits of making it a regular practice. So very glad I was introduced to this app, and I highly recommended it! This is wonderful, possibly the most positive change in my life this year. I have briefly tried other popular meditation apps, and I still think 10% Happier is the best. I love the lessons - giving me a sense of progress and guiding me to think about specific issue areas, like relationship and focus, I also use the individual guided recordings all the time for sleep, or when I find some time to meditate during the day. I appreciate that you get to know the names, voices and styles of the teachers - Joseph, Oren... - because meditation shouldn’t be an anonymous, faceless thing. Being aware of the teachers make me appreciate this as an individual journey that we each have to travel alone, but with each other’s help. I came to appreciate Dan’s interactions with them too because his self-deprecating humor makes me feel that I don’t need to be in a rush and even the most fidgety and skeptical of us can get this too. I feel very lucky to find this as my introduction to meditations. The app is very thoughtful and well-designed, I would certainly recommend it to others!